The Waxing Moon is the time after the New Moon when the moon is growing and gaining momentum toward her peak at the Full Moon. As the external moon is expanding, this is a time where you may also feel more mentally focused, motivated, and alive. With more energy (and also from what was revealed to you during the Dreamy Depths of the New Moon), you might be ready to work on and heal some old patterns, limiting beliefs, and pains that you have been carrying around since childhood that are affecting your life in this present moment. One of the healing tools we explore in depth during Priestesses of the Moon are Flower Essences. Flower essences are plant medicines that support your emotional and spiritual growth. Their ability to repair trauma, relax your nervous system and bring your emotionality into Wholeness is truly miraculous. When taken internally, they start to move subconscious imprints to the conscious mind - things you've suppressed will begin to loosen so that you can stop living from Wound and begin to live more deeply from a place of Empowerment. Cedar - This beautiful Tree brings a deep sense of safety. If you have had any wounding in your life that has made you feel less than safe, Cedar will strengthen your system and bring a strong anchoring. This will allow you to open up to another, to share what is present for you, and to cultivate a depth of intimacy. Motherwort - she helps you create strong and appropriate boundaries for yourself. When you feel like you don't know how to say no, are saying yes to people-please, Motherwort is a wonderful ally. All of a sudden, you'll notice subtle shifts in speaking your needs without any guilt. Missouri Primrose - is your ally to call upon for a beautiful dose of worthiness into your being. When you are not feeling worthy, or you don't feel deserving of what you truly desire, Missouri Primrose will be a great friend. This flower essence reminds you of what you want to give and receive in relationships. Borage - she is the grand flower essence for upliftment and increasing courage. She will support you to stand in your truth, speak your unspokens, and follow your path. She will support your soul to fully incarnate so you are present and solid in your body. 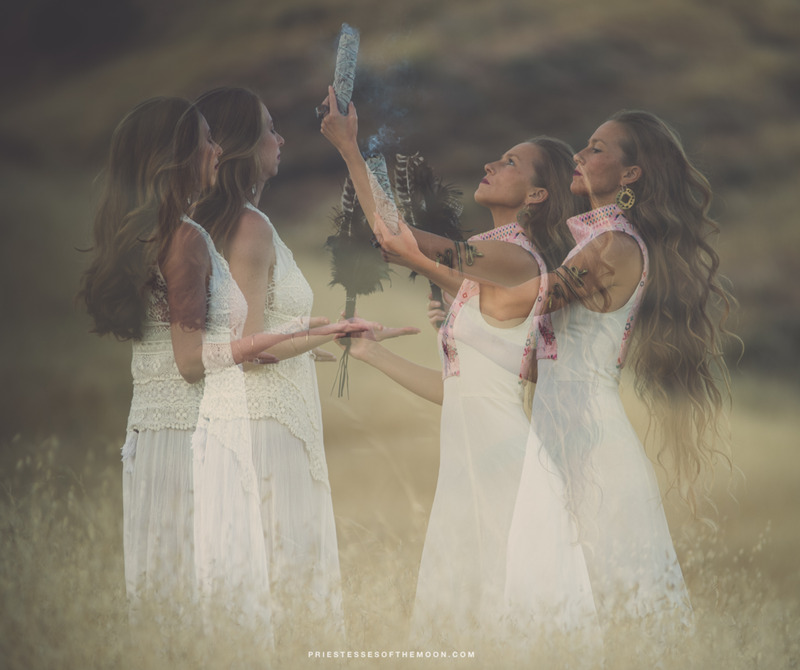 In Priestesses of the Moon, we will support you in deeper ways to find the flower essences and plant allies that will support your specific and unique needs for your growth and transformation. We'd love to hear how this information felt for you in the comments! Blessed Waxing Moon, love! This phase of the moon is all about expansion and outward expression. Are you feeling this? Next week we will also are experiencing the energy of Spring Equinox and the turning of the Wheel of the Year. The Spring Equinox being the halfway point between Winter Solstice and Summer Solstice, we are actually in the Waxing Moon phase of the first half of the year. We are coming out of the dark, cold winter months and feeling a bit more energy and momentum for rebirth and resurrection of Self and visions and the longings we carry. This does not mean that you are instantly feeling expansion, rather there is a progression into more of yourself - energetically, emotionally, spiritually, physically, and mentally. In Priestesses of the Moon, we liken the Waxing Moon to the Maiden Phase. Your Maiden carries so many great gifts and is an essential Ally for accessing your destiny and blueprint. She helps you to understand why you are here and how to move towards your great visions. The Waxing Moon phase is the optimal time for initiating, multi-tasking, completing your to-do list, organizing and scheduling meetings. At this phase, we have the energy and focus to be fully present for these types of activities. This is a specific Ritual in this portal of Spring. 1. Set quiet and sacred space for this Ritual. Light a candle and cast a circle. Anything INSIDE of the circle is sacred and part of the co-creative process with Spirit. 2. Take a moment to breathe. What do you wish to Rebirth over these next couple of months? What has been gestating inside of you throughout winter that is finally ready to be seen? 4. What feelings/thoughts/beliefs do you have as you write these on paper? Pay attention to what comes forward. Both limitations and excitement. 5. Take our your calendar. What steps can you take over the next 2-4 weeks to initiate/activate your visions? These can be simple and/or complex. They are meant to use the energies that are alive in you at this time to create movement (cause in a couple of weeks, you will want to be inward and dreamy again!). Do 1 action within the next 48 hours. Do the next within 1 week and the final within the next month. Please let us know how it goes. 6. Close your circle and give thanks for what you know in this moment is your next step or steps. Clarity is to be celebrated. We are wishing for your greatest gifts and Self to resurrect. The world needs your specific frequency to make radical impact at this time on the planet. So, initiate! Expand. And most important, with your Maiden by your side, have fun! Enjoy the process of sharing your Full Self with your family, community and world. We are sending you so much love, today on the magickal Friday the 13th. This day and night of the Goddess is honoured by Priestesses and Witches for its power and magick. We invite you to shed (if you haven't already) the patriarchal spell that was cast on Friday the 13th and spread as a day of bad luck and evil. In Priestesses of the Moon, we offer so many calls to creating space and ritual for each of the four main moon phases and this extends of course to different days of honourment and celebration, like today. The Waning Moon which we are in until the moon is new on the 15th is a time when we are more internally focused and there's an interest toward the mystical, dreamy, powerful, witchy and sensual aspects of our selves. Perfect for this auspicious day! 1. On Friday at the Venus hour (11am or 11pm), call upon the Goddess of Love as Venus, Freja, Aphrodite or any other Goddess you feel resonant with. Light and burn your candle that has been anointed with rose oil. Envision in your mind's eye that which you wish to experience in relation to love or prosperity as you wrap your ribbon or cord around your right index finger. 2. Place your pointer finger (still with ribbon) on your forehead at your 3rd eye (a quarter inch between and above your eyebrows). Concentrate your focus to `see` your desired outcome for 3 minutes. Enjoy the process of the energies of this day! We'd love to hear in the comments how this felt for you and your reflections on Friday the 13th.